Marzia Hussaini has always wanted to do something creative as a career and says she really enjoys working with flowers. The smell of freshly cut flowers wafts through the air at Moffatts Flower Company in Christchurch. Out the back the team are busy putting together bouquets to sell in the Moffatts shop and to other retailers. Among them is Marzia Hussaini. 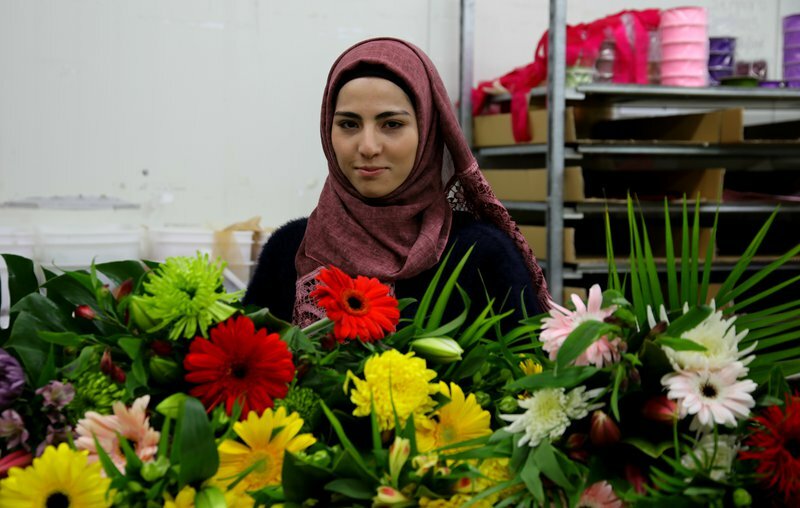 She’s a former refugee from Afghanistan and passionate about floristry. Her brother was one of the “Tampa boys” accepted by New Zealand in 2001; Marzia, her parents, and two other siblings joined him in Aotearoa three years later. She was only eight at the time. “I grew up in New Zealand and adopted the culture,” she says of her home. After finishing high school Marzia studied interior design and began looking for a job but wasn’t having much luck. She’d always had a passion for flowers though and completed a floristry course. “I enjoyed it so much and I looked for a job as a florist, but I was still unsuccessful until I came to Red Cross,” she says. The Pathways to Employment team in Christchurch got in touch with Moffatts Flower Company and started discussing possible job openings. They offered Marzia a trial which was followed up with a job offer. It’s been a life-changing opportunity for the young woman who says the role is fulfilling and has boosted her confidence. It’s a busy company with Managing Director, Steve Moffatt, estimating that they move around 6-7 million flowers a year. Some are grown on-site, and others are provided by growers in the region. Having Marzia on-board has helped keep things flowing smoothly and Steve says she’s a pleasure to work with. Moffatts is also the suppliers for New Zealand Red Cross’ Red Rose Day and supporters of the organisations work. Our Pathways to Employment teams around the country work with former refugee job seekers who bring a variety of skills and experiences to their workplaces. If you’re looking for new staff you can get in touch with your local Pathways to Employment team here.